Start by chopping the jalapeno, shallot, garlic and ginger, then cut the orange in half and slice the half into rings. No need to be precise in the chopping — the purpose of the veggies and orange is simply to add flavor to the marinade. Combine the chopped veggies with the wine and soy sauce. Place the beef and marinade in a plastic bag and refrigerate for a few hours up to overnight-ish. Remove the tri-tip from the marinade (discard the marinade), place the beef on a plate and allow it to rest for about 30 minutes prior to grilling. Resting the beef at room temperature before putting it on a hot grill allows the meat to cook more evenly throughout — seared on the outside and cooked to the desired rare-ness inside. Grill the tri-tip over direct-medium-heat until done, turning once halfway through cooking time and rotating once per side for badass grill marks. Tent the cooked tri-tip with foil to rest for about 10 minutes before slicing it. 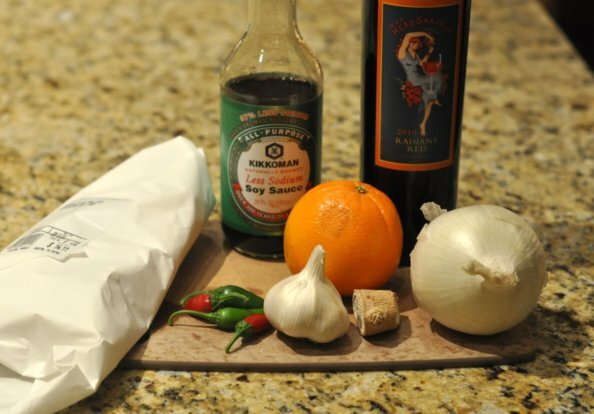 Mix the marinade ingredients together and add the marinade and the tri-tip to a resealable plastic bag. Refrigerate for 4 hours, up to overnight. Remove the tri-tip from the marinade (discard marinade) and allow the beef to rest at room temperature for about 30 minutes. Grill over direct-medium-heat, turning once and rotating once each side for grill marks, until desired level of done-ness. For medium-rare beef, pull the tri-tip off the grill at 130-135 degrees. Keep a close eye on the temperature after flipping and rotating the tri-tip so that it does not get over-done. Tent the grilled tri-tip with foil to rest for about 10 minutes before slicing and serving.